Your toilet flushes just fine, but it doesn’t know when to quit. Perhaps it stops running and then starts up again suddenly. Either way, it’s wasting a lot of water and making that noise that keeps you up at night. 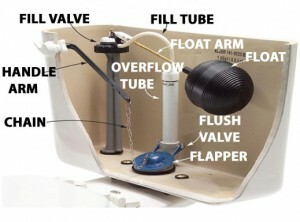 Fortunately, it’s usually not difficult or expensive to repair a toilet if you know a bit about how they work. Please help! Our toilet works, just it seems that it is constantly running. Sometimes if you “wiggle” the handle, it will stop- other times it doesn’t! Can you help? Get to know what’s in your toilet. Mechanisms vary, but they all work on the same principles. Flush a couple of times while you watch in the tank with the tank lid off and notice the process. When you push the handle, the chain lifts a flapper, letting a tankful of water fall through the opening in the bottom, into the bowl. As the water level drops, the flapper drops and closes the opening. Catch it in the act. If you’ve waited long enough after flushing and the toilet hasn’t quit running, lift the tank lid and look in. Close the flapper. If the tank is not full and it is not filling, chances are that the flapper is stuck open. Reach in and close it with your hand. If it sticks repeatedly, look for the cause. Make any necessary adjustments. If you have a ball seal instead of a flapper, is the wire that lifts the ball straight and does it move freely? Adjust the valve and float. If the tank is full and the flapper is closed, and water is running over the top of the overflow tube, but the toilet hasn’t stopped running, first try adjusting the valve and float. Pull up on the float with your hand. If this action stops the flow, then adjust the level of the float. No matter how you adjust the float, adjust it so the tank stops filling when the water is about an inch (2.5cm) below the top of the overflow tube. A leaking flapper can be caused by excess pressure if the tank level is too high, even with a brand new replacement. If the float is around the valve post, pinch the metal clip and slide the float down on the wire. Make sure the float ball isn’t touching anything else. Adjust it so it isn’t dragging against the side of the tank, the overflow tube, or anything else. Make sure the float ball isn’t leaking or filling with water. If you unscrew the float ball and hear water inside when you shake it, replace the float ball. Replace the flapper. If the toilet stops filling and then starts again intermittently, you have a slow leak. The most common cause of slow leaks is a leaky flapper. Over time, this inexpensive rubber part decays, or minerals build up on it. Cleaning may work to remove mineral buildup, but it’s usually best just to replace the whole part. Take your old one with you to the hardware store if you want the comparison to get the right size. To perform the replacement, simply close the valve sticking out of the wall under your toilet tank. Flush the toilet. If the valve is completely closed, the tank will not refill and you will not hear water running after the tank empties. Pop the old flapper off its hinges, disconnect it from the chain, and pop the new one into place. Run a finger carefully around the rim where the flapper seats. Remove any uneven buildup of minerals that might cause a leak. While replacing the flapper use a sponge with bleach to clean the flapper seat. Try flushing a few times to make sure the chain is the right length for the new flapper. It should open when you push the handle and then drop closed all the way when the tank empties. You may have to trim and adjust the chain by trial and error. Also, make sure that the flapper aligns properly with the opening. If none of the above work, it’s time to call your local plumber, Bob Oates Sewer Rooter at 206-789-4944. We offer emergency service & have qualified service technicians on-call & readily available. Call anytime – we’re here to help!